The push for creating a dynamic and engaging corporate culture is at an all-time high. Companies and firms are making huge strides to be younger and hipper to escape generational cohort boundaries and attract the best and brightest college grads. With drastic corporate structural and cultural change becoming commonplace, it’s important that companies implement these 4 things to keep up. Gone are the days of rigid 9-5 hours. Flex-time is the new industry standard for keeping employees engaged in their personal priorities by giving them the choice to set their hours. Are you an early riser that does your most efficient work in the morning? Great. Come to the office at 7 and leave at 3. Do you enjoy sleeping in and think you do your best work at night? Then come in at 11 and leave at 7. Want to make more time for your kids? Work from home two or three days a week. In a generation dying to find work-life balance, it is essential to present your employees with options. Flex-time is a company’s way of saying that they care about their employees, their health, and their personal passions. Millennials feel that it is their duty to give back to others. And if your company’s business line doesn’t directly correlate with helping others, incorporating social responsibility into your work culture is a must. Find ways to give back to your immediate surrounding community in a bold and impactful way. From taking a company-wide day off, taking on a huge service project, or collecting food donations for a local food pantry, corporate social responsibility matters to millennials. Serving in a way that doesn’t directly correlate with your line of business is even better, as it is even more genuine and selfless. Feeling like you are included as a part of the company community is extremely important to maintaining employee retention. If you still format your culture with a top-down mentality, your young employees will stay with your company for at the most 3 years. It’s very important for your lower-level employees to feel comfortable voicing their concerns and career aspirations to upper-level management. By opening up lines of communication your new employees will become more invested in your company’s mission and success, which most likely means they’re sticking around. Tear down office cubicles and replace them with long streamlined tables, couches and comfortable chairs to resemble a local coffee shop. Workers should feel free to enter the space and sit anywhere they feel comfortable to sit at that moment. Keep in mind to include plenty of outlets and charging stations for mobile devices. Expect workers to wear ear buds for their own peace and enjoyment. 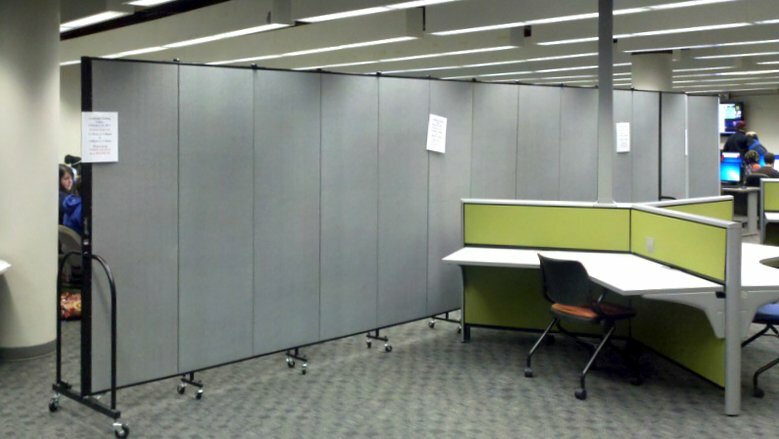 Offer portable temporary walls for a collaborative workspace and privacy.